Thai Prime Minister Abhisit Vejjajiva has conceded defeat to opposition leader Yingluck Shinawatra in the country's first general election after years of political unrest. 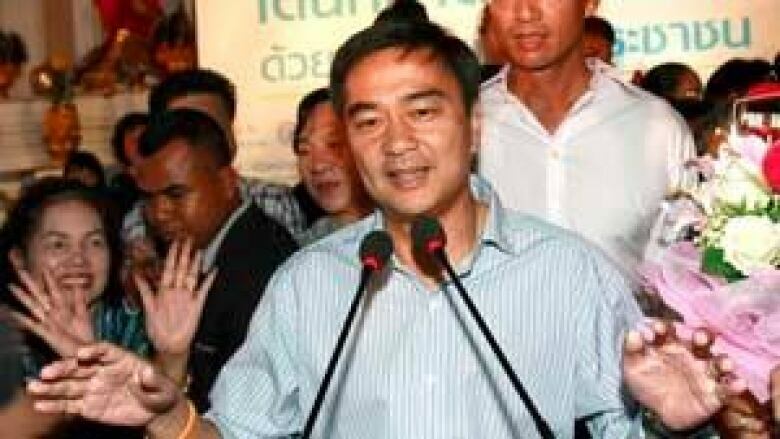 Thailand's prime minister, Abhisit Vejjajiva, conceded defeat Sunday to rival Yingluck Shinawatra in the country's first general election after years of political unrest, and has resigned as party leader. Abhisit congratulated Yingluck, the youngest sister of former prime minister Thaksin Shinawatra, who was overthrown by a 2006 military coup and now lives in exile in Dubai to avoid a corruption conviction. "It is now clear from the election results so far that the Puea Thai Party has won the election, and the Democrat Party concedes defeat. I would like to congratulate the Puea Thai Party for the right to form a government," he said on television Sunday. With 98 per cent of the vote counted, preliminary results from the national electoral authority indicated Yingluck's Puea Thai Party had a strong lead with 264 of 500 parliament seats, well over the majority needed to form a government. Abhisit's Democrats won 160 seats. The apparent election result paves the way for Yingluck to become the Southeast Asian kingdom's first female prime minister. Speaking to a throng of cheering supporters at her party headquarters in Bangkok, Yingluck declined to declare victory until final results are released. But she said: "I don't want to say that Puea Thai wins today. It's a victory of the people." From exile 4,800 kilometres away in the desert emirate of Dubai, Thaksin hailed the outcome. "People are tired of a standstill," he said in an interview broadcast on Thai television. "They want to see change in a peaceful manner." He had stated earlier in the weekend that he would not return to Thailand if it was seen to cause problems. Yingluck was earlier quoted as saying if she wins the vote, she would attempt to address Thailand's growing gap between rich and poor. Last year, dozens of Red Shirt activists, mostly from rural Thailand, were killed in clashes between protesters and troops in the centre of Bangkok. The protesters were mainly supporters of Thaksin, whose ascent to power in 2001 changed Thailand forever, touching off a societal schism between the country's haves and long-silent have-nots. The marginalized rural poor hail his populism, while the elite establishment sees him as a corrupt, autocratic threat to the revered monarchy and the status quo. That schism has played out through pro- and anti-Thaksin street protests since the 2006 coup. Many believe Sunday's vote was largely about the divisive legacy he left behind. Puea Thai "is being led by his sister at the moment, who has absolutely no political experience. She's a complete political neophyte and her only popularity with the Red Shirts, with the rural poor, who are a slim majority of the population of Thailand, is that she's related to Thaksin," Canadian journalist Michael McAuliffe told CBC from Bangkok. The Democrat Party — backed by big business, the military and circles close to the royal palace — continuted its losing streak in national elections since 1992. It only came to power in 2008 because a series of court rulings removed Thaksin's successors from the prime minister's office.